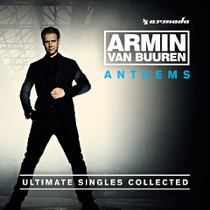 Armin van Buuren’s upcoming album ‘Armin Anthems: Ultimate Singles Collected’ is now confirmed. Armin’s first fan-voted album will go on sale 7 November, and can be pre-ordered now on iTunes. Fans around the world were given the chance to vote for their ‘Top 5 Armin Anthems’, and with votes from around the globe, the results were tallied to create the final tracklist for the album. Clocking in at 20 tracks (see below), this album can truly be called the definitive collection of Armin van Buuren’s most iconic records. Armin: “This year I'm celebrating 20 years as a producer, releasing tracks and finishing the 34-city world tour for my last album ‘Intense’ in Amsterdam’s Ziggo Dome in December.